According to research, girls seem to access gratitude easier and with a broader scope than boys. How much of this is biological and how much is cultural is hard to say but it is likely both. A.) You didn't do it alone. Meaning you needed help. B.) You are now indebted to someone. Perhaps these messages go against the expectation of the "self-made man". But whatever the reason boys and men may struggle more to appreciate appreciation. In one experiment, researcher Todd Kashdan of George Mason University discovered that, while women felt greater levels of gratitude when given gifts, men reported feeling burdened and obligated to return the favor. "The way that we get socialized as children affects what we do with our emotions as adults," writes Kashdan, "Because men are generally taught to control and conceal their softer emotions, this may be limiting their well-being." And it isn't just men who may struggle with appreciating appreciation. 20th century writer, Dorothy Parker is quoted as saying, "Gratitude is the meanest and most sniveling attribute in the world." Chances are, if you are reading this [excerpt], you are not of the same frame of mind. But, especially if you have sons, you may want to discuss gratitude more deeply to explore whether any of these messages are getting in. 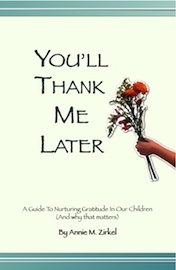 Gratitude is an extremely valuable trait to instill in both our boys and our girls. If, like me, this is an important topic for you and you would like to learn more, you may appreciate my book, You'll Thank Me Later. And feel free to share your thoughts as well. Posted in Uncategorized on May 21, 2010 by annie zirkel.